Prime Minister Sheikh Hasina on Tuesday feared the movement against quota system in government jobs was an inconspicuous campaign against freedom fighters children’s priviledge but said her government was looking into the matter without defying the apex court order for its retention. “We cannot ignore the court order and abolish completely the freedom fighters quota (but) we have constituted a committee headed by the cabinet secretary to look into the matter,” she said while inaugurating the electronic alloance payment system for freedom fighters. The premier said the government already decided that if the freedom fighters children were not found to fill up the quota reserved for them, candidates from the merit list would fill the positions in line with an order of the Supreme Court’s Appellate Dividsion. Sheikh Hasina opened the electronic payment system called G2P or “Government to Person” for disbursing the freedom fighters monthly allowance and other financial benefits through a video conference from her Gonobhaban residence with officials, local public representatives, political leaders and beneficiaries of Cox’s Bazar district. Liberation war Affairs Minister AKM Mozammel Huq also spoke on the occasion while secretary of the ministry Apurup Chowdhury gave a presentation on the overall activities of the ministry. Prime Minister’s Principal Secretary Md. Nojibur Rahman conducted the programme. Apurup Chowdhury said out of total 2,30,438 gazetted freedom fighters, 1,86,404 would would get the allowance through digital payment system and each of them would get monthly allowance of Taka 10,000, two festival bonuses, a new-year bonus and other financial supports. The premier said Bangabandhu introduced 30 percent quota for Freedom Fighters in government services after liberation along with 10 percent quota for women and physically challenged persons and honoured every martyred Freedom Fighters family offering them financial assistance despite the post independent Bangladesh’s economic crisis. Assuming office in 1996, she said, her government found no freedom fighter as candidadate for the government jobs despite enhancement of their age limit. The premier said the situation prompted her government to introduce the quota system for freedom fighters children and grandchildren to ensure their stake in the country’s governance. “But, some of our intellectuals who have no knowledge about the court order are speaking for annulment of the freedom fighters’ quota in their television talk-shows, writings and speeches,” she said. The poremier said at one stage of a violent anti-quota movement by a group of rowdy students she told the parliament that the system would be annulled though the movement and subsequent attack on Dhaka University vice chancellor’s residence was completely unacceptable. “We have to ensure that anti-liberation force and war criminals cannot come to power again or hold any post in the government machinery,” she said. Sheikh Hasina said after Bangabandhu’s brutal killing, the anti-liberation forces ruled the country, distorted the nation’s history, destroyed social and political fabrics and exposed the country to economc bankruptcy. 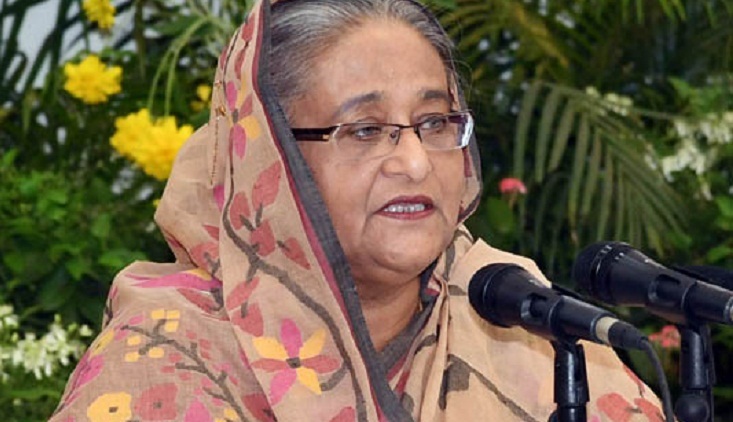 The prime minister said Bangabandhu founded the Muktizoddha Kalyan Trust and endoweding it 32 business enterprises which were abandoned by Pakistani owners after War of Liberation. “(But) in the 1975 situation none could come up with freedom fighters identity or as their family members,” the prime minister said. Sheikh Hasina said her government after coming to power in 1996 took initiatives to revive the glory of the independence and freedom fighters. “We have taken such steps so that children of a freedom fighter can proudly say that they are decedents of freedom fighters,” the prime minister said.